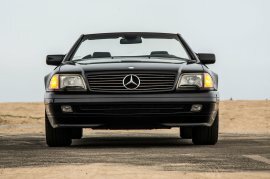 If you had to pick one convertible to represent the 1990s, the Mercedes-Benz SL-Class would be the favorite based on its pop-culture profile alone. Cut to Clint Eastwood and Charlie Sheen fearlessly driving a Mercedes 500SL through a couple of warehouse windows in “The Rookie” (1990), with all parties apparently emerging unscathed. “Engineered like no other car, ” says Clint. See also William Hurt’s cocky surgeon in “The Doctor” (1991), who indelicately describes his 500SL’s electronically triggered pop-up roll bar as an aphrodisiac: “my electric roll-in-the-hay bar.” Even doomed rappers Tupac Shakur and Biggie Smalls were fellow aficionados of the SL-Class. This wasn’t merely crass product placement; it was art imitating life. 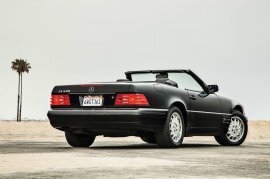 In Hollywood during the 1990s, if you wanted a top-dollar convertible with equal parts performance, prestige, and engineering excellence, there was the Mercedes-Benz SL, and there was everything else. Even today, this SL is a fixture in the movie business, the choice of aspiring screenwriters on the way up and of worn-out producers on the way down. The secret to the SL’s appeal in Hollywood during the 1990s was the same formula that endures today. It delivers understated German luxury, reliable powertrains shared with the S-Class sedan (inline-six, V-8, and V-12 in this case), a standard power-operated canvas top, and an optional, externally fitted hardtop that makes the car as weather-tight as a coupe. During an era when exotic cars were comparatively thin on the ground, this SL-Class was the most practical and easiest-to-drive sporting automobile you could buy. 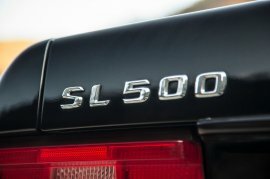 When the fourth-generation SL (known by its engineering code, R129) came to market in the U.S. as a 1990 model, longtime Benz design chief Bruno Sacco singled it out as “the most perfect car” of his career. 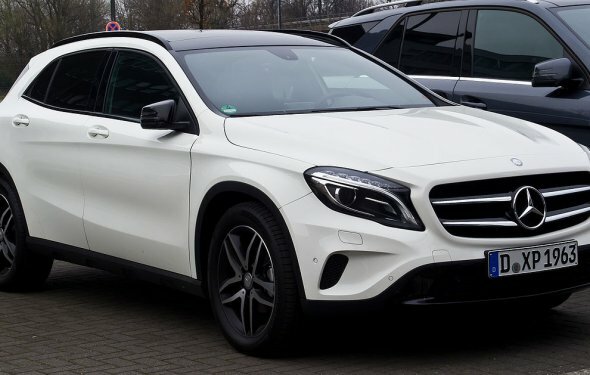 The squat, long-nosed wedge retains much of its machismo today, particularly when it wears one of the two staggered-width, 18-inch wheel sets from AMG that were offered as options. Underneath, the R129 thankfully keeps a safe distance from the notoriously overengineered W140 S-Class sedan of the same vintage, sharing instead many platform and suspension components with the workhorse W124 E-Class. The R129 stands at the crossroads of the analog and digital worlds, incorporating just enough contemporary electronic technology of our time to feel familiar, but not so much that you can’t work on it yourself. Things will break, and parts are expensive, but fundamentally these cars were built to last. I know. 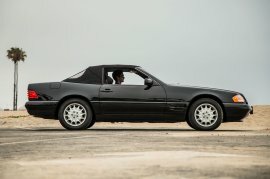 In 2012 I bought a 1998 Mercedes-Benz SL500 with 67, 000 miles on it that I still drive today. Ultimately the R129’s character is defined by what’s under the hood. The first question before you is whether you’re open to the six-cylinder R129, known as either the 300SL (1990-1993) or the SL320 (1994-1997). The former uses a 3.0-liter, DOHC inline-six making 228 horsepower and 201 lb-ft of torque, while the latter has a 3.2-liter enhancement of the same engine with 228 hp but a much-improved 232 lb-ft. You can find some shockingly low prices on pristine six-cylinder models. Next up is the 500 series, which consists of two distinct 5.0-liter V-8 engines: the hand-built DOHC M119 (1990-1998) that makes 315 hp and 347 lb-ft of torque in its final incarnation and the SOHC M113 (1999-2002) that makes 302 hp and 339 lb-ft of torque. By consensus among enthusiasts at 500benz.com, the M119 is more temperamental, but its longevity is legendary. You’ll see 200, 000-mile specimens of this V-8 in classified ads. Finally, there’s the 600 series (1993-2002), which features the 6.0-liter M120 V-12. Essentially a pair of inline-sixes paired together, this 389-hp, 420 lb-ft monster added a few hundred pounds to the 500’s already ample curb weight, so it didn’t offer much of a performance improvement. From the driver’s seat, however, it’s a different experience from the moment you twist the key. The M120 sounds sublime, humming urgently at idle and ripping effortlessly through the midrange with a velvety intake snarl. But if you want to keep this V-12 running tip-top, you better be prepared. There’s precious little space in the engine bay for hands and tools, and some independent mechanics will be reluctant to undertake major repairs for lack of experience, sentencing you to a four-figure spanking at your Mercedes dealer. Of course, even modern Mercedes models have a hell of a time holding their value, which brings us to the sorry state of the R129 market. Today, , 000 gets you a well-maintained specimen of this Mercedes-Benz SL-Class with fewer than 100, 000 miles, while $15, 000 procures the proverbial cream puff. That’s a bummer for owners who were silly enough to think of this SL-Class as a potential investment, but it’s great news for fans of world-class wheels on the cheap. If you find a R129 that hasn’t been neglected and treat it with care, it should give you years of reasonably faithful service in return. Perhaps you will learn to lunch at Barney’s Beanery in Santa Monica and even sell a screenplay. It’s all about the driving. And whether you pick the SL with its letters positioned after the number denoting the engine (1990-1993) or the SL with the letters positioned before the numbers (1994-2002), any well-maintained R129 should provide a dignified driving experience. The ride can be brittle over rough pavement, but on a decent road, the car is a mobile meditation chamber, and meticulous build quality keeps squeaks and rattles to a minimum. Handling? The R129 rolls significantly on initial turn-in as you steer with the vague recirculating-ball system, but the car repays your trust with neutral mid-corner balance (the weight distribution is close to 50/50) and a sense of underlying control. Then you punch the gas and ride that splendidly smooth wave of engine power all the way to redline. You can feel the uncompromising engineering in the way the R129 moves, and this alone is worth the paltry price of admission.